The remarkable life of former Sonics superstar Spencer Haywood was given its film documentary treatment, and premiered Saturday at the Seattle International Film Festival. The celebration was for the telling of the franchise’s best story about the franchise’s most talented player. Spencer Haywood, trail blazer and trouble-maker, gold medalist and goldbricker, drug addict and paragon of sobriety, was back in the town where he became its first pro sports superstar. 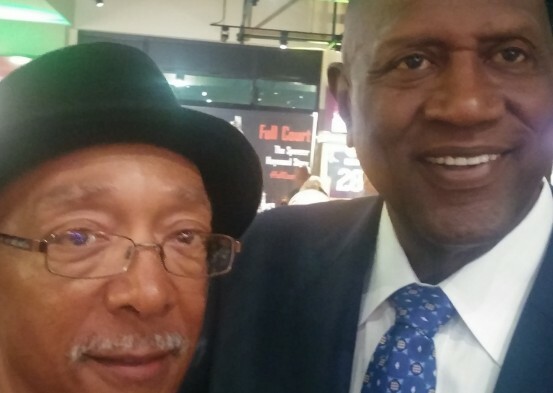 Haywood’s complicated saga was rolled out for the first time in 90-minute, documentary film form at the world premiere of “Full Court: The Spencer Haywood Story,” at the sold-out Uptown Theater Saturday during the annual Seattle International Film Festival. Haywood was joined in Seattle by his wife, Linda, several family members and friends. One of his newer friends is executive producer and Seattle businessman Dwayne Clark, whose company, True Productions, chose the Haywood story as its first effort. At film’s end, Haywood, Clark, director Martin Spirit and narrator Chuck D, co-founder of the rap group Public Enemy, addressed the audience. Haywood, whose long-overdue entry in September to the Basketball Hall of Fame helped trigger the film’s production, was profuse in his thanks to Seattle, its fans and particularly Wilkens, who as Sonics player-coach proved one of the most important mentors in Haywood’s turbulent youth. Haywood also declared that the NBA should bring back the Sonics “immediately,” which, of course, drew rousing cheers. He also encouraged fans’ use of “prayer and meditation” to help the cause, tools undoubtedly useful in Haywood’s sobriety that has reached 28 years, but perhaps unpersuasive when it comes to arenas and politics, surely the province of the devil. For those unfamiliar, Haywood’s story runs heights and depths sufficient to require oxygen at both ends. One of 10 children born to Eunice Haywood, widowed before Spencer’s birth, in dirt-poor, segregated, rural Mississippi of the 1950s, Haywood’s enormous hands (his fingers had extra knuckles) and rare athleticism advanced him from the cotton fields to the apex of celebrity in Seattle, New York and Los Angeles in the Seventies. His controversial hire as a 21-year-old by the Sonics’ first owner, Sam Schulman, in 1970, was fought by the NBA because the deal threatened its rule that banned signing players until four years had passed from high school graduation. Schulman took the legal fight all the way to the U.S. Supreme Court and won. By a 7-2 vote, the court struck down the NBA rule and opened the way for Haywood to make a living as soon as anyone else, changing the NBA game forever. A young attorney representing the losing NBA before the Supremes, David Stern, suddenly had his first reason to dislike Seattle. Not saying he’d harbor a grudge, or anything . . .
On the basketball court, Haywood was incandescent. At age 23 in the 1972-73 season, he averaged 29 and 12 rebounds. The best statistical year of LeBron James was also at 23 — 31.4 and 6.1. But after five seasons in Seattle, where he helped make the NBA relevant for the first time, the coach/general manager, the legendary Bill Russell, tired of Haywood’s ball dominance and lack of defense. Just before the 1975-76 season, Russell traded Haywood to the New York Knicks amid a barrage of criticism from Haywood about the coach, Sonics teammates, fans and media. But the Knicks had their “savior.” Only it didn’t work out that way. Although Haywood’s glamorous marriage to superstar model Iman made the couple “the president and first lady of New York,” according to one of film’s interview subjects, Haywood’s fade was hastened by heavy cocaine use. He was traded to the New Orleans Jazz and then on to the Los Angeles Lakers in time for the rookie season of Magic Johnson. Haywood’s LA time ended in humiliation, when in the middle of the 1980 NBA Finals, he was booted off the team by coach Paul Westhead for falling asleep in practice after a night of partying. Divorce from Iman soon followed. But the long way back has included a stable marriage, four daughters, a construction business, a home in Las Vegas and a level of contentment and life experience that allowed Haywood, 67, to share honestly in the film the grief caused by addiction and self-destructive behavior. The film’s highlights are the explorations of Haywood’s impoverished roots, as well as the civil rights movement that led to tumult in Olympic sports and the college and pro games. Haywood chose not to boycott the 1968 Olympics in Mexico City, where he helped lead the U.S. team of collegians to gold. But two years later, declaring, “I can’t eat my gold medal,” Haywood jumped early to the pros. Whether it was over race, money or his game, Haywood was the object of controversy and abuse almost everywhere he played. Because he was so candid, the film overdid its use of Haywood’s own reflections. The insights and ruminations of Wilkens, Charles Barkley, Pat Riley, Harry Edwards, youth coaches, friends and relatives and friends were valuable. Haywood, often staring directly into the camera, seemed semi-scripted, more lecturing than conversational. The most poignant laugh of the evening, however, came wordlessly. Explaining that a shoe company salesman from Portland named Phil Knight was eager to get the Sonics star signed to an endorsement contract for his new company, Haywood said Knight offered him cash or stock in the company. Haywood offered up a cringe, then put a giant hand over his face in mock shame. Nike, according to Forbes, is the world’s 18th most valuable brand at $27 billion, six spots behind Amazon. Can’t eat the Supreme Court win, either. But now, sports fans can know a great story. Long time coming. Young players today have no idea what Woody did in the past and how it influences their careers today. Kawhi Leonard, Draymond Green and Hassan Whiteside are the NBA’s best defensive players? Woody would DESTROY them. When Woody was averaging 12 RPG he had a teammate (Jim Fox) averaging 11 RPG. Rare is the time you have two players averaging double figures in boards and certainly not in today’s game. Looking forward to eventually seeing this film. It was fun for the flashbacks. Haywood was a tremendous player. “my room mate Mary Is getting paid on the internet $98/hr”…..!kj244ytwo days ago grey MacLaren. P1 I bought after earning 18,512 Dollars..it was my previous month’s payout..just a little over.17k Dollars Last month..3-5 hours job a day…with weekly payouts..it’s realy the simplest. job I have ever Do.. I Joined This 7 months. ago. and now making over hourly. 87 Dollars…Learn. More right Here !kj244y:➽:➽:.➽.➽.➽.➽ http://GlobalSuperJobsReportsEmploymentsProfitableGetPay-Hour$98…. .★★★★★★★★★★★★★★★★★★★★★★★★★★★★★★★★★★★★★★★★★★★★★★★★★★★★::::::!kj244y….,….